Cultivating to control weeds refers to three specific methods which can be used to keep the unwanted plants in check. A tiller can be used to forcefully remove the weeds by uprooting their stems. Depending on the type of tiller you are using, there are space requirements for doing an effective job. The use of organic mulch or synthetic mulch prevents the weeds seeds from making contact with the soil, taking hold and growing. This is another useful cultivating process which is often used to interfere with the growth process of weeds. The third and final method is using cover crops which crowd the growing area and squeeze out any room the weeds may have to grow. 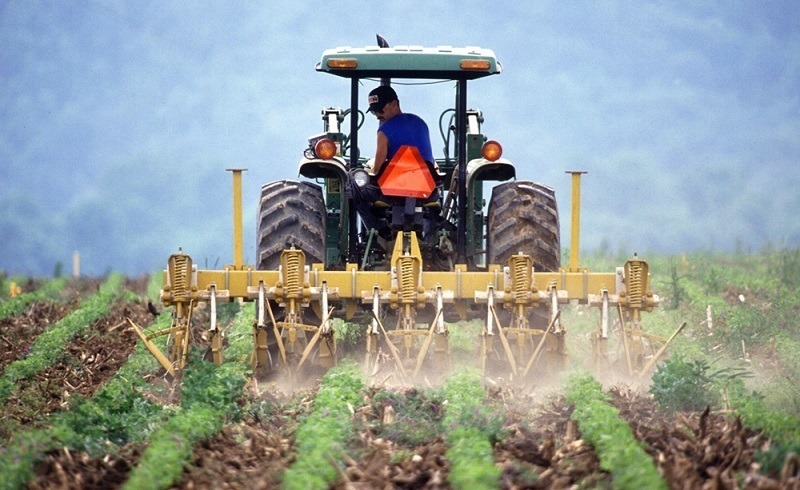 This article provides specific information about each cultivating weed control method. 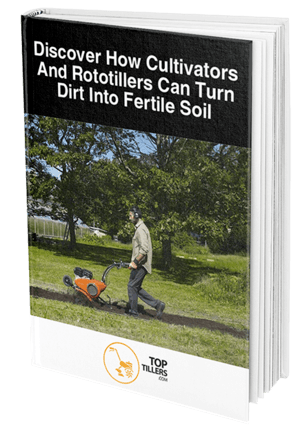 There are several types of tillers on the market which work by using rotating blades which break up the soil and go in deep to cut up and remove weed roots. Tillers have the advantage of being able to work on a plot of land quickly and efficiently. Compared to pulling weeds manually with hand tools, this process is much faster and saves your body from the ravages of hard labor. Usually, when using a tiller, the soil is tilled one row at a time. When you reach the end of a row, you will have to disengage the clutch and stop the rotation of the blades so you can get the unit around and continue. 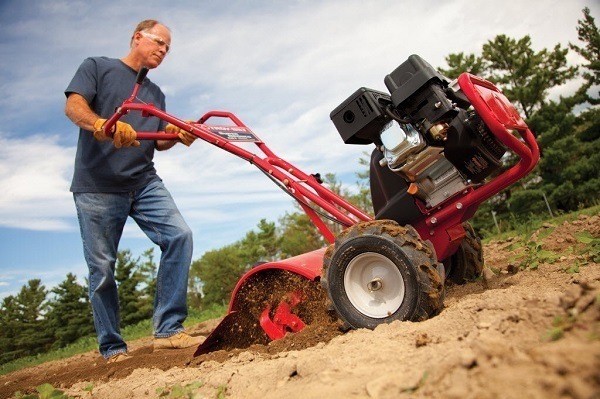 Selecting a type of tiller depends on the hardness of your soil and the size of the area that will be used on. 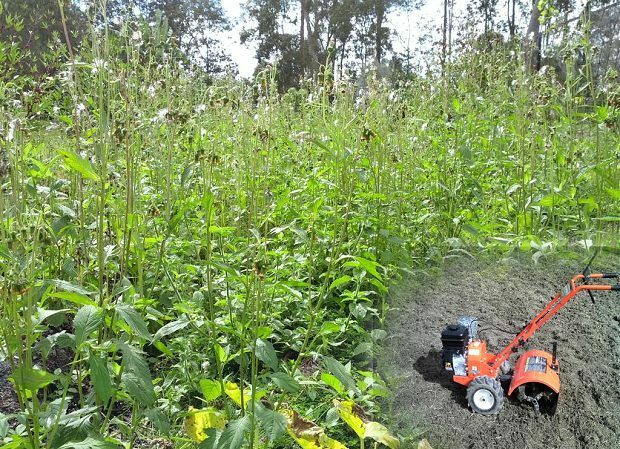 If you will be using it solely for weed removal, a smaller less powerful tiller is often enough to get the job done. Larger and more powerful tillers are used for such tasks as turning a lawn into a flower bed. One of the easiest and effective methods of organic weed control is adding mulch to your soil. A generously distributed thick layer of mulch can suppress and discourage the growth of weeds in two types of ways. When the soil is thoroughly covered, the mulch deprives the weed seeds of light and prevents them from gaining a foothold and growing. Also, bare dirt is an ideal location for weeds seeds to land on and germinate. When the soil is thoroughly covered with mulch, the weeds will not be able to make contact with the soil, preventing them from taking root. Healthy plants require soil which has a consistent level of suitable moisture. Mulch assists in retaining soil moisture, ensuring that your plants do not become stressed and susceptible to diseases and insects. 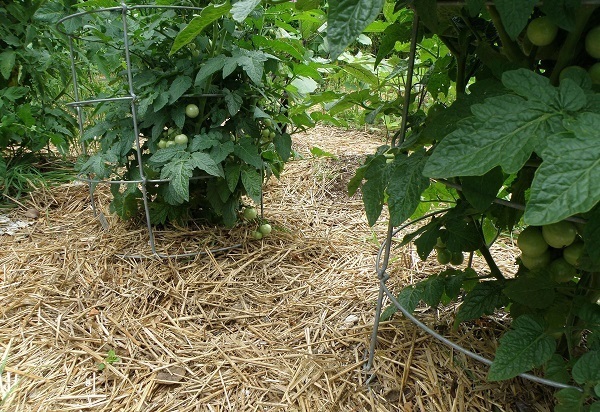 The mulch also keeps the soil cool in warm weather, which is healthier for the plants. The main benefit of organic mulch is that it will break down over an extended period, amending your soil with much needed organic matter and nutrients. The organic mulch is broken down by microbes and worms in the soil, which results in better soil for your garden. There are several types of organic mulch with all of them having various strengths and weaknesses. Examples include shredded leaves, chipped bark, grass clippings, straw, pine needles, compost and cocoa hulls. You can gather many of these types of mulches for free if you have access to such vegetation in your area. The most expensive organic mulch is the cocoa hulls, which have an Earth-like appearance (dark brown) so the mulch is not readily noticed. Depending on your garden's needs, you should select the type of mulch which works best for your situation. As for synthetic mulch, this can consist of rubber, plastic or glass. The key difference between the synthetic and organic mulch is that the synthetic one will not break down over time. Therefore, unlike the organic mulch, the synthetic mulch will not add nutrients, nor organic matter to your soil. There is also the aesthetic difference when it comes to organic and synthetic mulch. Some homeowners may prefer to keep their gardens looking as natural as possible and refuse to introduce synthetic materials to the soil. Several forms of synthetic mulch may be less expensive than their organic counterparts, as you will not be getting as much comparable value. Cover crops can also be planted to manage the growth and spread of unsightly weeds by preventing their growth and crowding them out of the picture. The process of cover cropping also offers the benefit of protecting the soil from heavy rain and erosion from wind. The cover crops are most effective when dealing with perennial weeds, but can also assist in smothering annuals when they are planted during consecutive seasons. When the proper cover crops are used, they have the potential of suppressing the growth of even tough weeds. This process of weed control is completely environmentally friendly and should be strongly considered. When cultivating to control the spread and growth of weeds, it is essential that you determine which method is best for your plot of land. Tilling, mulching and cover cropping all offer an effective way to prevent weeds from taking over your valuable garden. All these methods are an environmentally friendly method of organic weed control and do not contaminate your soil with harmful chemicals. If you are looking to forcefully uproot existing weeds quickly and efficiently, using a tiller is probably the best way to go. Mulching is ideal for when you want to prevent weeds seeds from getting light and growing. Whether organic mulch or synthetic mulch is used, it is easy to apply and spread over the ground. The final method is cover cropping, which takes some work in that it entails planting other vegetation to squeeze out the weeds by not providing them sufficient room to grow. Deciding on the appropriate cultivating method depends on your needs and the amount of time you have for gardening. There are advantages and disadvantages which also must be weighed in coming to a conclusion.